Before I became a parent, I knew the kind of mother I wanted to be, I didn’t know it had a label, it was just what I had experienced as a child. When my first child was born I was a department manager for a corporate retailer. Fortunately, whilst on maternity, having unwittingly purchased cloth nappies online from a company just a few miles away, I discovered Baba Me (www.babame.com) and Maebh Collins. 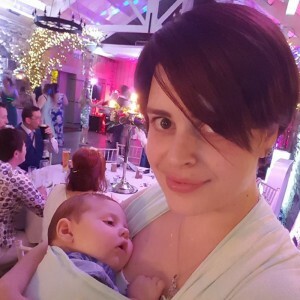 Maebh helped me get training as a baby carrying consultant through Trageschule and later Slingababy, supported the local nappy library I had volunteered for, and just as I was due to return to corporate retail, offered me a job as her website manager. At the same time I realised that there was an opportunity for the nappy library to also offer sling advice and breastfeeding support under the one roof, and The Library Group was born. We now fall under the APUK umbrella with meets across Northern Ireland.